There’s a 6 year age gap between my eldest and youngest, and we quite often spend longer trying to figure out what activity to do than actually doing it! 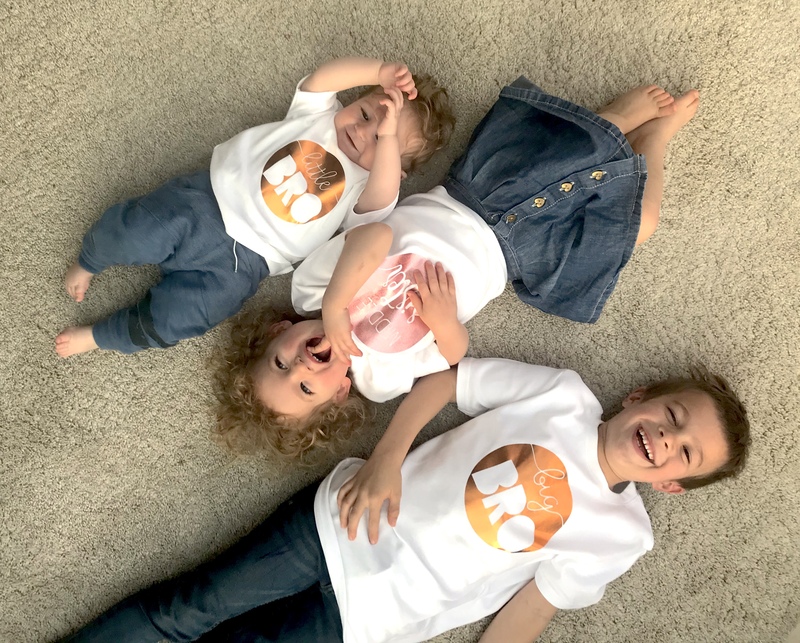 To illustrate this post, I thought it would be fun to dress my 3 kids up in their Teether.co.uk matching brother sister t-shirts! For the record, getting them to all sit/lay still whilst showing the designs was not easy! A particularly brilliant way to find clubs and activities for kids from 0 – 18 all over the UK is through the Club Hub app or website. It’s obviously not just for parents of kids with large age gaps, but I use it to find things to do in my local town. It’s an excellent source of inspiration when you’re having a moment of ‘what the heck to do’, or during those “mum, I’m bored” moments! On Club Hub you’ll find pre-school classes, dance, cooking, martial arts, learning languages to soft play centres, attractions and events. Pretty much anything your kid’s hearts desire! Which of these will you be doing at the weekend? Leave me a comment if you’d like me to add your idea! Pretty much every town now has a trampoline park, or at least has one nearby. Our local Flip Out in Basingstoke has activities for all ages, including a little soft play for the teeny ones whilst the older ones are jumping. Science centres and discovery centres where you go to teach and learn things are really great for all ages. For young children, there’s lots to take in and experience, and they’re equally as engaging for older children. We love going to Winchester Science Centre, and The Lookout Discovery Centre in Bracknell. Find science activities on the Club hub site. This is actually a brilliant activity that’s not just for buggy-bound children and mums who just had a baby. You can join buggyfit at any stage after having a child, and you can also bring your older children along to get involved in the activites. You can be doing wall-sits one minute, press-ups and running for beanbags the next, and it’s brilliant to get your kids involved in physical activity at any age, and you’re setting an awesome example. Another brilliant fitness idea for all ages is Park Run. Read more about my postnatal fitness journey, and when I used Buggyfit Basingstoke to get my strength back after having Indi. There are somereally fun fitness classes to do with your kids here. A weird one, but chores have got to be done, right? Why not rope all your kids in, and make it fun. Have fun and get stuff done…. win, win! You might think climbing centres are not for young ones, but actually, a lot of climbing centres like Rock Up are brilliant for all ages. They hold specific activities for all ages like soft play and toddler climbs! For those who don’t mind sand getting everywhere, the beach has got to be one of the most fun activities of all time. Sand castles, frisbee, burying dad, swimming, ice creams, sandy sarnies – what’s not to love? Planting is super fun for kids to get involve in. I find, give kids a bit of responsibility and they thrive! They can enjoy watching the plants grow over time, and even help to maintain and water them. Visit Club Hub to find gardening activities near you. Read about when we made gardening fun with Scotts Miracle Grow, and when Indi made an edible fairy garden. I love a museum. There’s usually so much STUFF to talk about and see, that your kids end up learning so many things. Kids of all ages usually find museums fascinating. We love Milestones, and The Natural History Museum. Here are some more museums around the UK. Great for a rainy day; you can build Duplo towers, do junk modeling, build towers with playing cards, have lego making contests. My kids love a contest, so turn anything into a competition and they’re game. Here are some fun building clubs to get involved in. If you can get your kids to sit still enough to watch a movie (mine just about last an episode of Horrid Henry), then making a big deal of snuggling under a blanket, sharing popcorn and choosing a movie to watch is a good one. Brilliant if you want to sit still and not have to do anything apart from pick up popcorn off the floor and sofa! It’s a small price to pay for a bit of quiet. Generally a nope for me (to much noise and craziness for me), but Playgroups are good for under school aged kids. They’re especially great for parents who need to safely entertain a toddler whilst nursing a baby. Playgroups are usually abundant (within walking distance), and cheap, and you usually meet some other parents if that’s something you’re keen to do! This is something I recently stumbled across when searching for free age gap activity ideas to do with my kids after a particularly expensive Christmas period! If you have kids that like to find treasure and solve clues, or even for those who just love to be outside running around, then Geocaching is so fun! You use your smart phone, and the Geocaching app to locate ‘caches’ hidden around your local area (or wherever you happen to be). I think you’ll be surprised to see just how many people have stashed secret caches near you! A park we go to all the time has 4 in, and we had no idea. Hidden in trees and under bushes, and there’s one we are yet to find! Check it out. Here are some more activities for kids who love exploring. Might sound boring, but walking is one of the best things to do with kids. It’s so good for relieving stress, for clearing the mind, and for physical wellbeing. You can take the kid’s scooters, buggy boards, skateboards etc. and just see where you end up. You can even make walking to school fun. Get your kids to count their steps, or see who can power walk the quickest. or even play eye spy on the way. If it’s bad weather, there are loads of walking and activity classes you can go to across the country. There are farms everywhere, even in urban areas now. There’s always a farm nearby. You can pet the animals, have a drink in the cafe, get muddy in mazes, watch lambs being born, help milk cows…all sorts of fun for all ages. Check out some farms across the UK. I’ve not yet met a kid that doesn’t like slime! Image courtesy of So Slime DIY. Slime is sooooo popular right now. You can make it yourself, or use a slime making kit like the So Slime DIY Kit shown above. This particular kit allows you to make glittery, colour changing slime with secret surprises! A kit like this is good for those who are rubbish at following recipes (like me). Not for babies, obvs, but it’s a great activity to keep for a rainy day when the older kids are climbing the walls! If the thought of slime in your house is a bit too much for you, check out these slime-themed classes! An obvious one, but still a good one. There might be a climbing frame, maybe some outside gym equipment or a boating lake. You can have a picnic, play games, do sports and activities. We’ve even held birthday parties in the park… twice… free venue, why not! Kids love snacks, so why not make a deal of it, and have a picnic! Now, you don’t even have to go out for a picnic. You can hold one at home. Lay a blanket down in your house or garden and put on your best snack spread. It depends on the ages of your children, but providing you’ve got enough hands on deck, swimming is a lovely activity for families. Even if it’s just bobing around in the big pool, it’s refreshing, good for wearing the kids out and working up an apetite, and also you don’t have to bath them later on! Join a swimming club here. Argh. The place where parent’s souls go to die. I am rarely opinionated, but when it comes to soft plays I just can’t deal. But I know they are brilliant for running off lots and lots of steam, and kids have SO much fun. There will be a baby and toddler area to plonk your littlest down in whilst the older ones run riot on the zip wires and ball pools. Depending on your children’s age gaps, you may even get to have a nice drink and possibly a short relax! You can find local soft plays, here. 2p machines. Frugal fun for all the family! It’s super easy to make, and if you can deal with the mess it makes, it’s a great activity for a rainy day. Check out this playdough recipe which will save you lots of money on shop bought. My brother and I used to live in dens. We even used to sleep over night in them. We’d make cardboard tunnels out of boxes stuck together with tape, and have our own quarters with working doors and windows. We really were living our best lives, and now you can too! Painting can obvisouly become very messy in a matter of seconds, but I found some awesome paint sticks that create little to no mess at all. I’m not surprised they have won a gazillion awards. They’ve literally delighted my kids and I. They’ve been able to “get the paints out” at any time of day without me having to find an excuse for them not to. My children have made lovely, vibrant pictures with Little Brian Paint Sticks, and I recommend them all the time to my friends. There are loads of messy play activities you can do at home and in the garden, and lots of them are suitable for all aged kids. Slime, sand, dough, foam… there are so many ideas to explore with your children, and they don’t have to be super messy. Check out these messy play activities. My kids love gymnastics, and Fin is in the Basingstoke Men’s Artistic Squad, so we’re quite serious about it! You can find gymnastics clubs on Club Hub. There are groups for all ages, even babies, and it’s a brilliantly active, disciplined sport to get into. 26. Hand Them Over To Their Grandparents! My friend told me to include that one 😉 It’s pretty legit. Bath bombs have such an appeal to kids! The fizzy, bright coloured balls make bathtime more fun, and you can even make them! Read about when we made our own bath bombs with So Bomb DIY. So there you have it, 27 brilliant age gap activity ideas to do with your kids, whether there is a big age gap between them or not. The key sometimes is to find something engaging to do during even the most boring of activities such as hanging washing out or walking to school. Remember to check out Club Hub which is brilliant for finding clubs and activities for all ages up to 18. And if you love to celebrate all things matchy matchy, check out Teether.co.uk for the big bro, middle sister and little bro tees you’ve seen in the pics in this post.